The driver and cleaner of a DCM van, which was ferrying cattle, were assaulted by a gang of five cow vigilantes near Bibinagar on the city’s outskirts on Monday night. 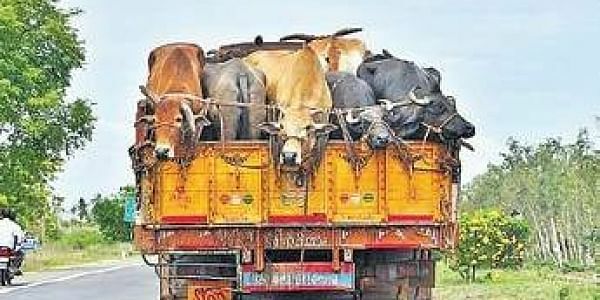 HYDERABAD: The driver and cleaner of a DCM van, which was ferrying cattle, were assaulted by a gang of five cow vigilantes near Bibinagar on the city’s outskirts on Monday night. Police seized the van and took the duo into custody. A case was registered against them for transporting cattle without valid documents. Police refuted the charge of any physical assault on the two by the so-called ‘gau rakshaks’. Police said city-based trader Abdul Ahad purchased 23 bulls at Kurvi in Mahabubabad district and was transporting the cattle to Hyderabad on Monday night. “As the van reached Bibinagar, two youngsters, said to be gau rakshaks, stopped it and started shouting ‘gau mata’ slogans. I got down from the van and tried to tell them that those were not cows but bulls. Suddenly, the two assaulted me and my driver without checking the animals. I bought 23 bulls and was transporting them to Hyderabad for slaughtering,” Abdul Ahad told the New Indian Express. As he was arguing with the two, three more ‘gau rakshaks’ joined. The vigilantes, now numbering five, allegedly thrashed Ahad and his helper before informing the police. Soon, a police team led by Bibinagar police sub-inspector D Suresh Kumar reached the spot and took Abdul Ahad and the driver into custody. Denying that anyone assaulted Abul Ahad, the sub-inspector said that the two were found to be transporting bulls without any valid documents of their purchase. “We have rescued the animals and have shifted them to a gaushala in Teachers Colony near Vanasthalipuram. Based on a complaint, we have registered cases against Ahad for illegal transport and cruelty to animals,” the sub-inspector said.